Bonnie is shown above winning one of her three majors. She had a beautiful baby doll face and tons of attitude. 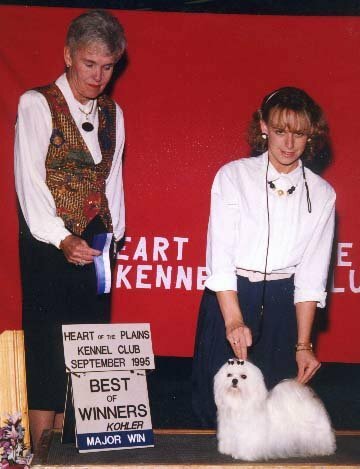 She was bred and co-owned with Susan Branham of Erinlee Maltese. We lost Bonnie on Dec 23, 1996, due to a complication one week after she had her first litter of a single tiny little boy. We truly miss her constantly smiling face.